Amelia B. Lima's lush and verdant wall of plants. 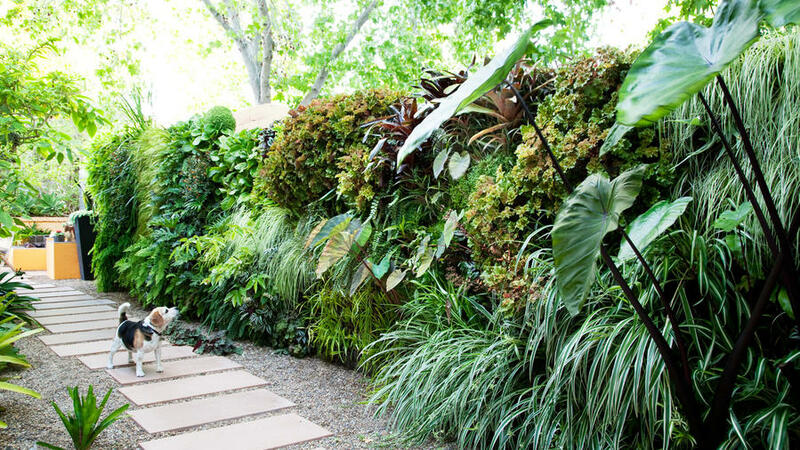 There’s no need to stick to the expected succulents when planting a living wall. San Diego landscape designer Amelia B. Lima (858/243-4470), inspired after seeing one of Patrick Blanc’s vertical gardens in Paris, hatched a plan to try his technique at home. This side view of the wall shows the handmade frame and the irrigation system built by Lima. One purpose of soil is to support roots, Lima says―if you create another way to hold them up, you could even plant shrubs. Along a 40-foot wall, she built a 7-foot frame fronted by marine plywood and corrugated plastic (ridoutplastics.com). She stapled on two layers of synthetic Tuf-Felt (sutherlandfelt.com), cutting slits in the outer layer, then slipped in and stapled down 400 plants. Now her sideyard is a jungle of ferns, bromeliads, coral bells, spider plants, and elephant ears. You’ll need patience, time, and a frost-free climate to get this look. Or try one of these three plantings in temperate climates―even indoors. 1. Set a row of small-leafed vines in pots on top of a wall and let them cascade at will. Good trailers: rosary vine (Ceropegia linearis woodii), string of pearls (Senecio rowleyanus), and English ivy (note: it’s considered a noxious weed in the Northwest). 2. Attach tillandsias (air plants) directly to a wall―they don’t need soil―using a waterproof adhesive like Tilly Tacker (rainforestflora.com). 3. Hang Neoregelia (a bromeliad forgiving of heat and light frost) on a wall. Wrap each plant’s rootball, including soil, in sphagnum moss held in place with a wrapper of bird netting, then staple to a grapewood or cork oak bark base.